Cold Creek remains one of my fondest places in spite of it becoming overrun with private development and RV campers. Maybe it’s the memory of the delight when I first discovered the place back in the late 1970s. There were no cabins then as the land was owned by the Bureau of Land Management. The creek gushed mysteriously from the cave at the end of the arroyo, and the little jeweled trout seemed to thrive in the creek despite its diminutive stature. I became so enthralled with the area that my college grade point average dropped a whole tenth of a point during my final semester because I frequently ditched the early evening classes so I could explore around Cold Creek in the early springtime. 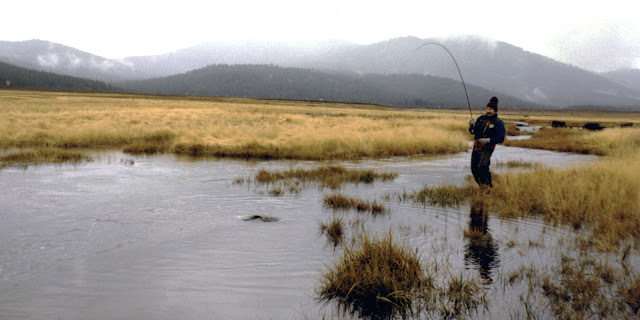 As I mentioned in previous writings, I caught my first trout on a fly in Cold Creek when I was attending the University of Nevada, Las Vegas, forever capturing my sensibilities and birthing the fly fishing passion that still haunts me today (see November Cold Creek 2006 blog). Nowadays the area has the activity of a small rural town, complete with commuters who work in the valley. 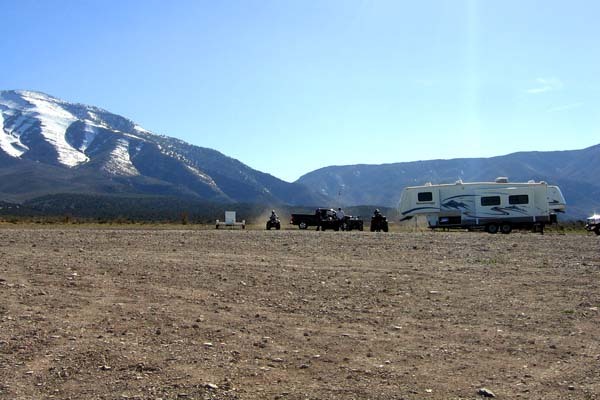 Weekends bring the RVers with their all-terrain-vehicles, or ATVs. I can’t blame them, really. 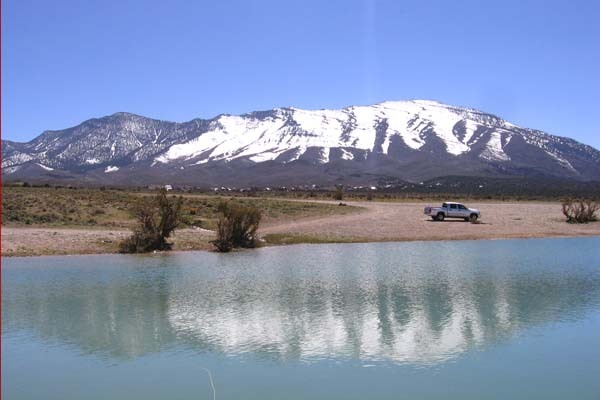 It’s not their fault Cold Creek is such a treasure to the Las Vegas community… but there are so many of them. Still, I find that if I steal away from the office on a weekday afternoon, before the commuters are returning to their reclusive cabin homes, I can frequently get the Cold Creek pond all to myself, and on a bad day might share it with only one or two other fisher persons. This particular Friday I had blocked out the day to go fishing, but a department meeting with my boss encouraged me to change plans. Besides, wasn’t it just a week ago that I was fishing Wayne Kirch; how much fishing does a person need after all? And then there is my office and the mound of neglected paper accumulated over the budget season, a season of particular concern with the economy sliding into recession. How could I justify the escape? And then there are the personal issues that can weigh a person down. Friends with severe illnesses, some terminal and some that are attacking young adults that should not have to endure such things in the springtime of their lives. There are the demands of children, both those at home and those on their own, and of the foster children. Decisions are needed about homework, preparations for college, career choices, and even basics needs such as getting the rent paid and fixing broken cars. Add to that the pressure of the adoption decisions pending over the foster children and, well, the trip to Cold Creek eventually won-out after lunch. So off I went to Cold Creek. In the last hour, around 3:30 pm, the rest of the RVers started to show up with all their accoutrements. It signaled the time for me to secure my tackle and start the forty minute drive home. 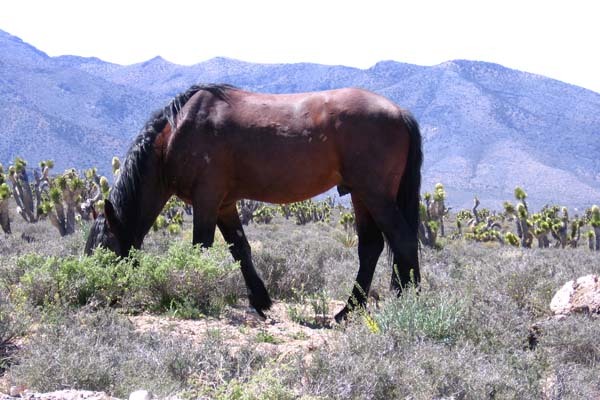 But I did stay long enough for a herd of nine wild horses to make its way to the pond for a drink and frolic in the water. The stallion was particularly frisky, braying and stomping around. I was happy to capture a little of that on my camera’s video. RVers with ATV at the ready! I don’t believe that I need distractions like fishing Cold Creek to cope with the stress of life. I believe that God will take care of my concerns. In Jeremiah 29, God says: “I say this because I know what I am planning for you”, says the Lord. “I have good plans for you, not plans to hurt you. I will give you hope and a good future. Then you will call my name. You will come to me and pray to me, and I will listen to you. You will search for me. And when you search for me with all your heart, you will find me!” I do find relief and pleasure in the diversions of nature. After all, He created it for our pleasure. But I know that no matter what, God would provide and care for me, now and forever, even if I was too old or infirm to experience places like Cold Creek. It’s springtime! This special season always holds such promise, especially after the doldrums of winter. Anticipation builds to the point it seems no longer containable. But, I am getting ahead of myself. 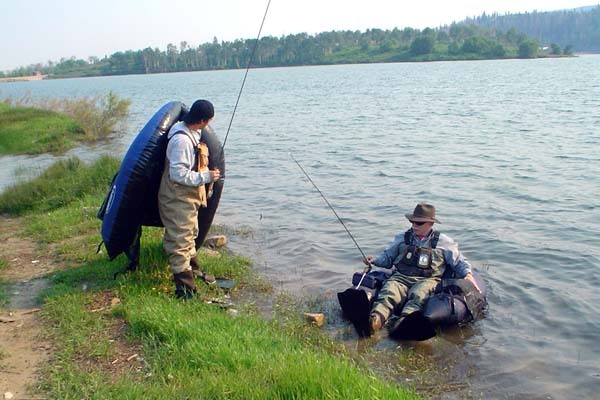 The float tube really revolutionized fishing lakes and ponds. 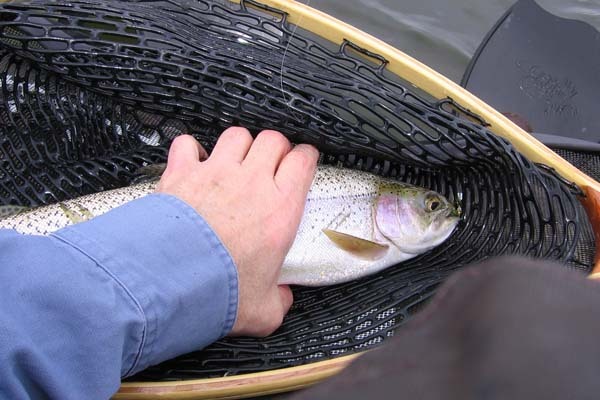 It is much easier to transport than a boat (deflating down to the size of a small suitcase), and it allows a stealthy approach to trout wherever they are holding or feeding. They started out as tire tubes with a harness, but innovators soon saw that designing them to be more like “half boats” made them easier to maneuver and provided a platform for elevating the angler out of the water (at least from the knee up). My only complaints are the need to dangle your feet in cold water for lengths of time and the difficulties of kick-paddling in windy conditions. 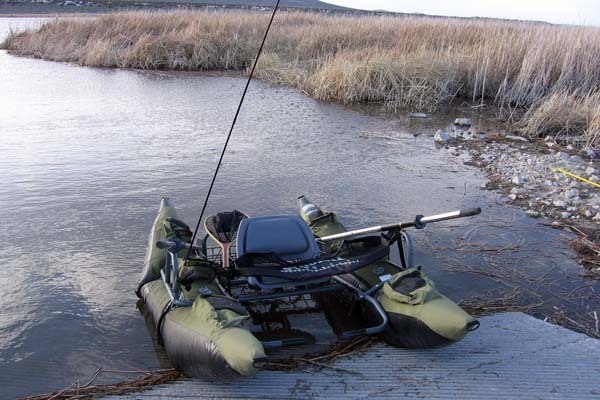 As much as I enjoy my float tube on lakes, for a couple of years I have been considering a pontoon boat. The pontoon, or “toon” as they call them, provides pegs to rest your feet out of the water and adds oars and oarlocks to the locomotion alternatives. I imagined the toon being able to cover more water quickly, especially in cold or windy conditions. The negatives are cost (they’re about two to three times as expensive as a tube) and portability. Most toon models use a metal frame to bridge and tie together the two pontoon bladders. The bladders range in size from seven to ten feet. 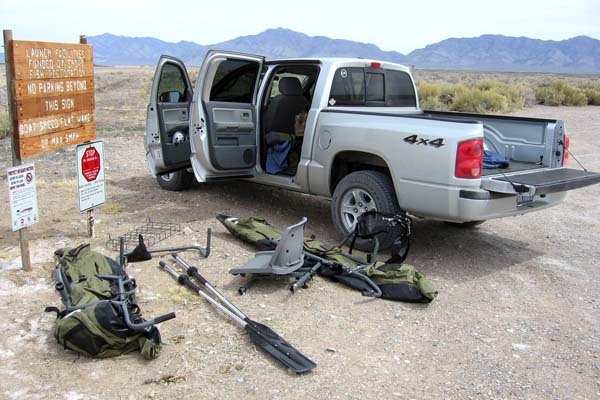 The frames are easy enough to assemble and disassemble, but it usually adds about twenty minutes on the front and back end of each fishing adventure, thus less time on the water fishing. 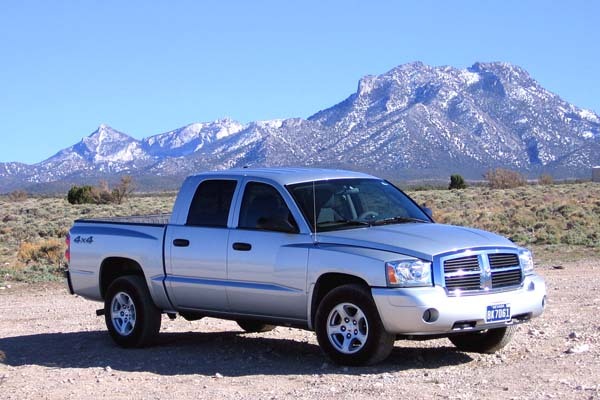 If you have a trailer or truck with a standard-size bed you could keep the whole thing assembled, but it is still awkward lifting the whole seventy pounds by yourself. While shopping Sam’s Club with Denise in March I noticed a toon for sale at $299. It had all the features you would expect from a model priced at $450 and up. After pondering the issue for a couple of weeks I bought my first toon. 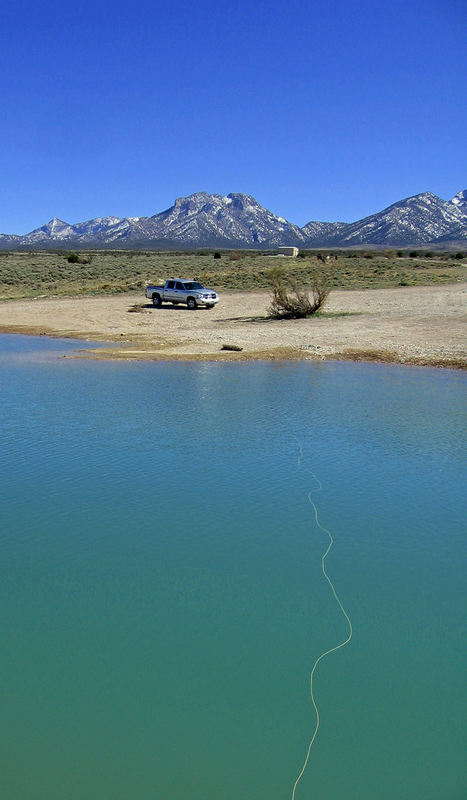 Its maiden voyage was launched at Cold Springs Reservoir in the Wayne Kirch Wildlife Management Area. 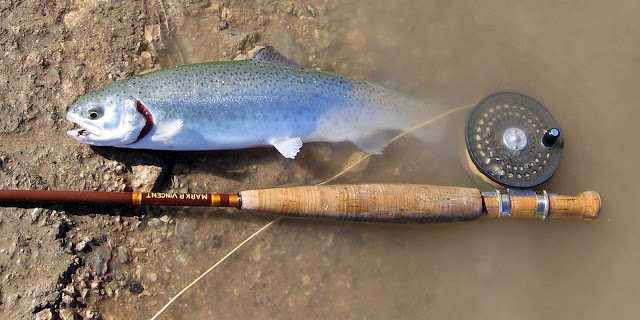 I had been envisioning a short fishing trip after the Budget Workshop, but as always things are busy at the City with or without the Budget Workshop looming. I penciled in the Friday after the workshop, but I had to shoot a City Scene budget episode that morning. It was scheduled for 8:30 am, and so I decided I could still get six hours of fishing if I left at 9:30 am. I taped the segment with a shirt, tie, and sport jacket over my jeans and tennis shoes. When I reached Cold Springs the wind was calm. There was a lone float tuber on the reservoir, but he departed shortly after I got on the water (probably an omen to the rising winds). I assembled my new toon and pushed off from the boat launch. I immediately realized that rowing a toon is not as easy as it looks. I spent quite a bit of time on the water learning how to row forwards and backwards, and how to spin the toon 360 degrees in either direction. Feeling slightly comfortable that I could manage, I began to fish in earnest. Of course, that was when the winds kicked up. Gusts seemed to reach well over thirty mph. Rowing in either direction became really difficult work; the toon’s higher profile means it catches more wind. I could move the toon where it needed to go, but the energy and force I was exerting began to call into question my sanity. One feature the toon has is a pulley anchor system. The anchor is a mesh bag into which you insert fifteen or so pounds of rocks. Dropping that anchor in shallower water did indeed slow down the wind drifting, but once the anchor made it to deeper water I was off to the races, quickly securing my fly rod and grabbing for the oars to move back into position. I must admit I the wind was really frustrating me. I was able to get some fishing in. The water temperature was still cold, and the color slightly murky. 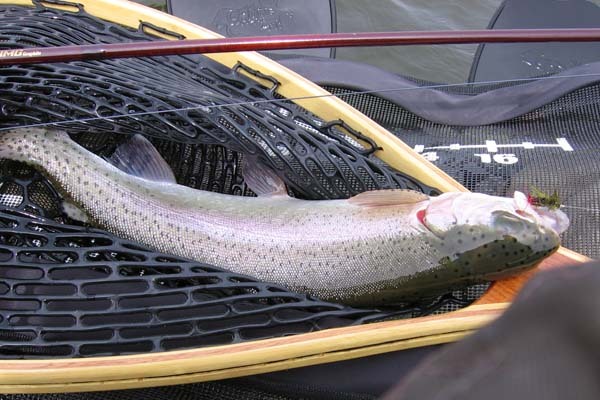 The trout were down deep and sluggish, and so I used my fast-sinking fly line with large wooly buggers and streamers (green seemed to be the color of preference with these trout). I hooked up with ten trout, but landed only six of them. 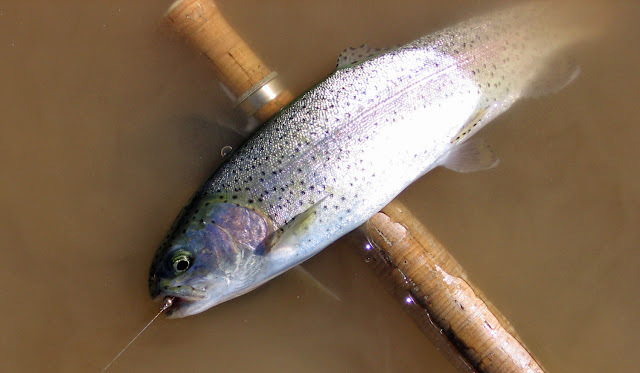 Two that I landed were very heavy sixteen inchers, probably full of roe as it is the spawning season for rainbow trout. 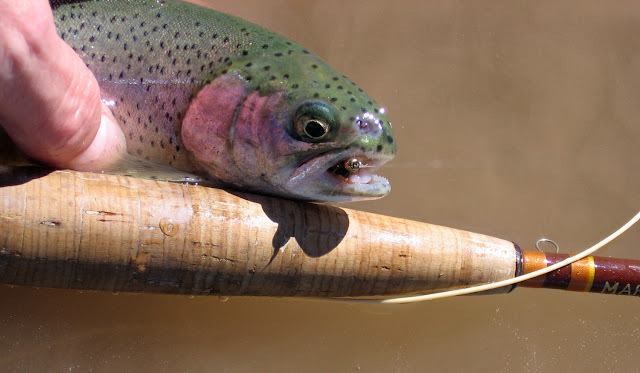 I managed to hook a couple of others that seemed quite heavy; one managed to snap my tippet while fighting and the other had the hook pull out after shaking vigorously. I had them on long enough to feel their weight and strength. Still, getting hooked up is the best part of the battle; landing and releasing them becomes anti-climatic. I did notice that the larger fish did not have much “jump” in them, preferring to dive deeper into the early-season weed growth. The smaller twelve-inchers were very acrobatic. I attempted to use my camera’s “movie” mode while playing a few fish. It’s not as easy as you would think, playing a trout with your left hand while looking through the view finder in your right to film the event. Much like rowing the toon, it will take some practice to improve this technique. Still, the trip was very worth while. 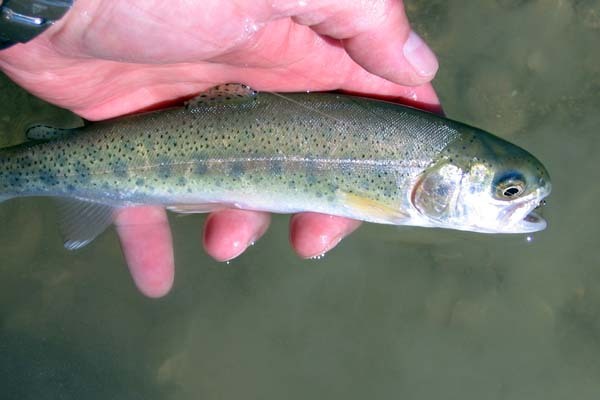 I gained precious experience maneuvering the toon, caught several really nice trout, and enjoyed some rare wildlife in the process. The dirt road connecting Wayne Kirch to State Highway 318 is a smooth dirt road of about four miles long, with stretches that support speeds to sixty mph. About half way to the 318 I noticed a large, dark bird flying low (about twenty feet off the ground). The reservoirs attract a large variety of birds, including herons, egrets, and various birds of prey. From a distance I was uncertain about its identity, but then it swooped up and over, diving into the sage on the right-hand side of the road. The next thing I saw was a small desert cottontail rabbit run to the other side of the road and into the sage. The bird then lifted off from behind the brush in pursuit of the rabbit. It rose in flight just as the truck was reaching the attack site and it became obvious it was an immature golden eagle. I was able to watch the remaining pursuit over my left shoulder after passing through the incident. I had never witnessed anything that dramatic and so close; I was surprised that the eagle maintained enough concentration to continue the chase, but then the youngster must have been awfully hungry. I also had two separate coyote sightings along the highway in the twilight hours. Springtime has a way of stirring the animals like no other time of the year; I guess that includes me, too.